This week we have a guest blog post from Javier Burgués. Enjoy! I would like to introduce you a rather unknown application of the CrazyFlie 2.0 (CF2): chemical sensing. Due to its small form-factor, the CF2 is an ideal platform for carrying out gas sensing missions in hazardous environments inaccessible to terrestrial robots and bigger drones. For example, searching for victims and hazardous gas leaks inside pockets that form within the wreckage of collapsed buildings in the aftermath of an earthquake or explosion. To evaluate the suitability of the CF2 for these tasks, I developed a custom deck, named the MOX deck, to interface two metal oxide semiconductor (MOX) gas sensors to the CF2. Then, I performed experiments in a large indoor environment (160 m2) with a gas source placed in challenging positions for the drone, for example hidden in the ceiling of the room or inside a power outlet box. From the measurements collected in motion (i.e. without stopping) along a predefined 3D sweeping path that takes around 3 minutes, the CF2 builds a map of the gas distribution and identifies the most likely source location with high accuracy. The MOX deck (Fig. 1a) contains two sockets for 4-pin Taguchi-type (TGS) gas sensors, a temperature/humidity sensor (SHT25, Sensirion AG), a dual-channel digital potentiometer (AD5242BRUZ1M, Analog Devices, and two MOSFET p-type transistors (NX2301P, NEXPERIA). I used TGS 8100 sensors (Figaro Engineering) due to its compatibility with 3.0 V logic, power consumption of only 15 mW (the lowest in the market as of June 2016) and miniaturized form factor (MEMS). Since the sensor heater uses 1.8V, two transistors (one per sensor) reduce the applied power by means of pulse width modulation (PWM). The MOX read-out circuit (Fig. 1b) is a voltage divider connected to the μC’s analog-to-digital converter (ADC). The voltage divider is powered at 3.0 V and the load resistor (RL) can be set dynamically by the potentiometer (from 60 Ω to 1 MΩ in steps of 3.9 kΩ). Dynamic configuration of the load resistor is important in MOX gas sensors due to the large dynamic range of the sensor resistance (several orders of magnitude) when exposed to different gas concentrations. The sensors were calibrated (by exposing them to several known concentrations) to convert the raw output into parts-per-million (ppm) concentration units. Schematic of the conditioning electronics for each MOX sensor. The initialization task of the deck driver configures the PWM, initializes the SHT25 sensor, sets the wiper position of both channels of the potentiometer and adds the MOX readout registers to the list of variables that are continuously logged and transmitted to the base station. The main task of the deck driver reads the MOX sensor output voltage and the temperature/humidity values from the SHT25 and sends them to the ground station at 10 Hz. Experiments were performed in a large robotics laboratory (160 m2 × 2.7 m height) at Örebro University (Sweden). The laboratory is divided into three connected areas (R1–R3) of 132 m2 and a contiguous room (R4) of 28 m2 (Fig. 2). To obtain the 3D position of the drone, I used the Loco positioning system (LPS) from Bitcraze, based on ultra-wide band (UWB) radio transmitters. Six LPS anchors were positioned in known locations of the experimental arena and one LPS tag was fixed to the drone. The six LPS anchors were placed in the central area of the laboratory, shaped in two inverted triangles (below and above the flight area). Figure 2. Experimental arena. The green squares indicate the position of the UWB anchors, which are positioned along two inverted triangles (green lines). Figure 3. 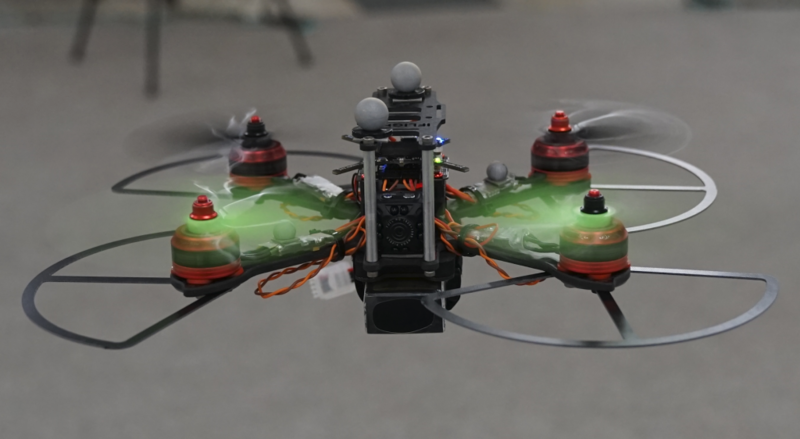 The CrazyFlie 2.0 equipped with the MOX deck and the UWB tag (center) gets its 3D position from the LPS system (left). The location and sensor data are communicated to the ground station (right) over the 2.4 GHz ISM band. A gas leak was emulated by placing a small beaker filled with 200 mL of ethanol 96% in different locations of the arena (Fig. 4). Ethanol was used because it is non-toxic and easily detectable by MOX sensors. Two experiments were carried out to check the viability of the proposed system for gas source localization and mapping in complex environments. In the first experiment, the gas source was placed on top of a table (height = 1 m) in the small room (R4). In the second experiment, the source was placed inside the suspended ceiling (height = 2.7 m) near the entrance to the lab (R1). Since the piping system of the lab runs through the suspended ceiling, the gas source could represent a leak in one of the pipes. A 12 V DC fan (Model: AD0612HB-A70GL, ADDA Corp., Taiwan) was placed behind the beaker to facilitate dispersion of the chemicals in the environment, creating a plume. The experiments started five minutes after setting up the source and turning on the DC fan. Figure 4. Gas source location in two experiments. (left) Experiment 1: inside small room; (right) Experiment 2: hidden in suspended ceiling. 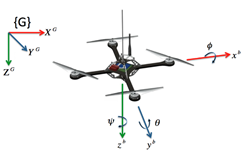 The drone was sent to fly along a predefined sweeping path consisting of two 2D rectangular sweepings at different heights (0.9 m and 1.8 m), collecting measurements in motion (Fig. 5). These two heights divide the vertical space of the lab in three parts of equal size. Flying first at a lower altitude minimizes the impact of the propellers’ downwash in the gas distribution. For safety reasons, the trajectory was designed to ensure enough clearance around obstacles and walls, and people working inside the laboratory were told to remain in their seats during the experiments. The ground station communicates the flight path to the drone as a sequence of (x,y,z) waypoints, with a target flight speed of 1.0 m/s. The CF2 reports the measured concentration and its location to the ground station every 100 ms. Figure 5. Predefined navigation strategy based on zig-zag sweeping at two heights (0.9 and 1.8 m). At the end of the exploration, the ground station uses all the received information to compute a 3D map of the instantaneous concentration and the ’bouts’. A ’bout’ is declared when the derivative of the sensor response exceeds a certain threshold. Bouts are produced by contact with individual gas patches and some authors use them instead of the instantaneous response (which is more affected by the slow response time of chemical sensors). For gas source localization, we compare two approaches: using the cell with maximum value in the concentration map or using the cell with maximum bout frequency. The bout frequency (bouts/min) is computed as the bout count in a 5 second sliding window multiplied by 12 (to convert it to bouts/min). In the first experiment, the drone took off near the entrance of the lab (R1), 17 meters downwind of a gas source located in the other end of the laboratory (R4). From the gas distribution map (Fig. 6a) it is evident that the gas source must be in R4, because the maximum concentration (35 ppm) was found there while concentrations below 5 ppm were measured in the rest of the lab. The gas plume can be outlined from the location of odor hits. The highest odor hit density (25 hits/min) was found also in R4. The cells corresponding to the maximum concentration (green start) and maximum odor hit frequency (blue triangle) were found at 0.94 and 1.16 m of the true source location, respectively. Figure 6a. 2D map of the instantaneous concentration (ppm) measured in Experiment 1 (in log scale). The odor hits are represented by blue circles. A hand-drawn ellipse outlines the approximate plume shape based on the location of odor hits. Figure 6b. (top) Trajectory of the CF2 along the z-axis. (bottom) Temporal evolution of the measured concentration (ppm) on a log scale, with odor hits highlighted in red (the black star indicates the start of an odor hit). The identifiers R1–R4 indicate the area of the map in which the drone is flying at each moment. The maximum instantaneous concentration and the maximum odor hit frequency are indicated by a green star and a blue triangle, respectively. In the second experiment, the gas source was located just above the starting point of the exploration, hidden in the suspended ceiling (Fig. 7). The resulting maximum concentration in the test room was measured when the drone flew at h=1.8 m, highlighting the importance of sampling in 3D for localization and mapping of elevated gas sources. However, since the source is presumably not directly exposed to the environment, concentrations below 3 ppm were found in most locations of the room, which complicates the gas source localization task. The concentration and odor hit maps suggest that the gas source is located in the division between R1 and R2, which represents a localization error of 4.0 and 3.31 m, respectively. Figure 7. 3D map of the instantaneous concentration (ppm) in Experiment 2. The black square indicates the gas source location (x,y,z) = (14.0, 5.2, 2.7) m, the black arrow the wind direction (positive x-axis) and the letter ‘S’ the starting point of the drone (x,y,z) = (13.5, 5.2, 0.0) m.
These results suggest that the CF2 can be used for gas source localization and mapping in large indoor environments. In contrast to previous works in which long measurement times were taken at predefined or adaptively chosen sampling locations, a rough approximation of such maps can be obtained in very short time with concentration measurements acquired in motion. The obtained gas distribution maps seem coherent with respect to the true source location and wind direction, and not only enable the detection of the source with relatively small localization errors but also provide a rich visual interpretation of the gas distribution. If you are interested in more details about this work, take a look at the journal paper or drop me an email at <jburgues8 at gmail dot com> or leave a comment on the blog! Malmö is known to be very beautiful in June. At least that’s what i’ve heard from the Bitcraze team when we talked about having a meet-n-geek in their offices in Sweden. I’ve been working on the crazyflies and developing artist friendly interface to control them for a year now, and I always was impressed with their philosophy of work and communication. Over the past year, they’ve helped me and my companies a lot to be able to create the shows we want, with our specific needs and constraints, that researchers don’t have, like fast installation time, or confidence in drone take off (you want to make sure that a drone won’t hit the theater’s director’s head at the very beginning of the show !). 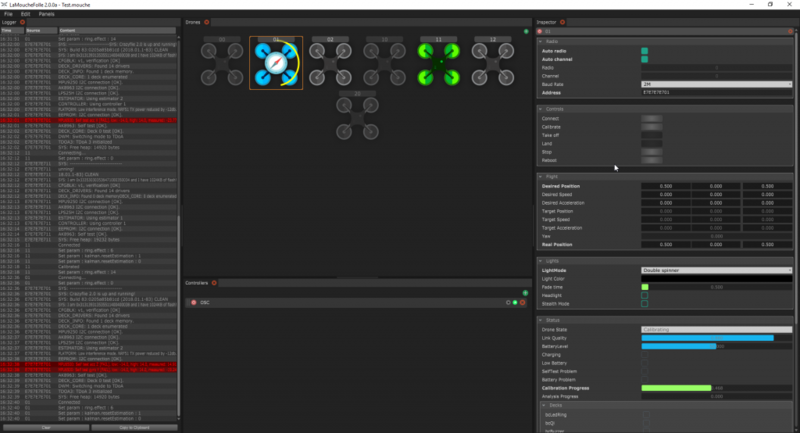 For that I created LaMoucheFolle, which is an open-source software with a nice UI to be able to connect, monitor and control multiple drones. LaMoucheFolle is not made to be a flight controller, but acts more as a server that any software will be able to use, like Unity or Chataigne. That way, people and users don’t need to handle all the connection, feedback, warning, calibration process and can concentrate essentially on the flight and interaction. While the fist version of LaMoucheFolle got me through most of the demos and workshops, I knew that it could be vastly improved if I understood better the drones, so I decided to ask the creators to meet them, and here I am ! As I hoped, being physically there allowed me to understand better what are their practices, and allowed them to better understand mine, so we could find a way to improve both their Crazyflie ecosystem and my contribution to it. – Normalized battery level and low battery log values : it allows for safe and consistent feedback of the battery level in percent, and an indicator if the drone should land soon. It will also possible to use this value to monitor the charging progression of a drone. – LedRing fade pattern : This mode allows for easy fading between solid colors on the led ring, so it’s not necessary to stream all the colors from one color to another, but instead having a very beautiful smooth interpolation, using only 2 parameters : the target color and the fade time. I hope you are as excited as I am about those new features, and if you’re not, please tell us what would make you “vibrate” ! I’ve been spending the last week at their office, and it was a great week : I initially came to improve my software, and discuss about future development of the Crazyflies [which was great], but what i’ll remember the most from this trip is by far the human aspect of the Bitcraze team. I’ve spent the last 5 years of my career at Microsoft on the team responsible for HoloLens and Windows Mixed Reality VR headsets. Typically, augmented reality applications deal with creating and manipulating digital content in the context of real-world surroundings. I thought it’d be interesting to explore some applications of using an augmented reality device to manipulate and control physical objects and have them interact with the real world and/or digital content. The HoloLens SDK has APIs for consuming hand gestures as input. 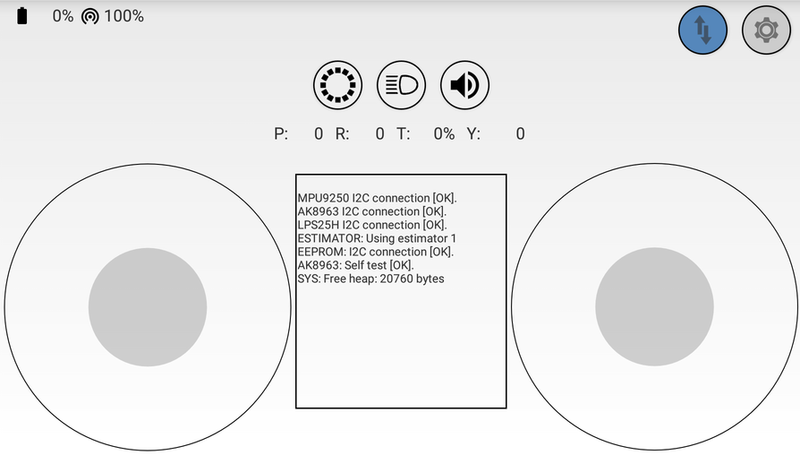 For the first phase of this project, I modified the existing Windows UAP/UWP client to handle these gestures and convert them to CRTP setpoints. I used the “manipulation gesture” which provides offsets in three dimensions for a tap-and-drag gesture, from the point in space where the initial tap occurred. 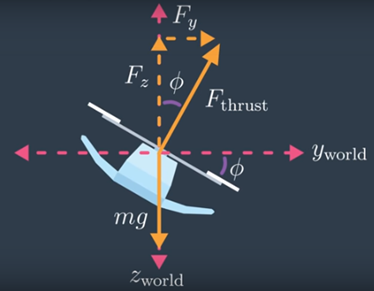 These three degrees of freedom are mapped to thrust, pitch and roll. For the curious, there’s an article on my website with details about the implementation and source code. Here’s a YouTube video where I explain the concept and show a couple of quick demos. As you can see in the first demo in the video, this works but isn’t entirely useful or practical. The HoloLens accounts for head movements (otherwise moving the head to the left would produce the same offset as moving the hand to the right, requiring the user to keep his or her head very still) but the user must still take care to keep the hand in the field of view of the device’s cameras. Once the gesture is released (or the hand goes out of view) the failsafe engages and the Crazyflie drops to the ground. And of course, lack of yaw control cripples the ability to control the Crazyflie. Adding a flow deck makes for a more compelling user experience, as seen in the second demo in the video above. 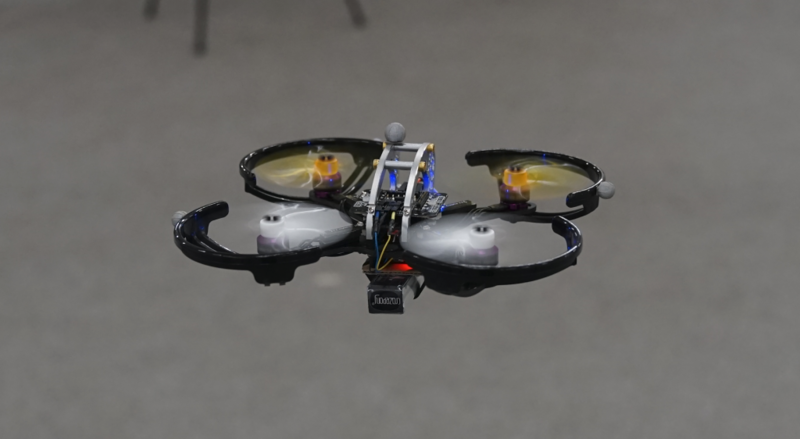 The Crazyflie uses the sensors on the flow deck to hold its position. With this functionality, the user is free to move about the room and make shorter “adjustment” hand gestures, instead of needing to hold very still. 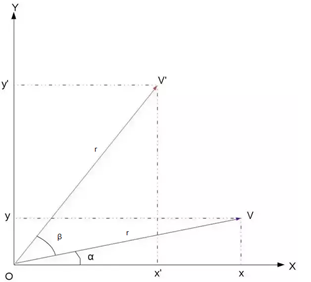 In this mode, the gesture’s degrees of freedom map to an x/y velocity and a vertical offset from the current z-depth. This is a step in the right direction, but still has limitations. The HoloLens doesn’t know where it is in space relative to the Crazyflie. A gesture in the y axis relative to the device will always result in a movement in the y direction of the Crazyflie, which begins to feel unnatural if the user moves around. Ideally, gestures would cause the crazyflie to move in the same direction relative to the user, not relative to the ‘front’ of the Crazyflie. Also, there’s still no control over yaw. The flow deck has some limitation as well: The z-range only goes to 2 meters with any accuracy. The flow sensor (for lateral stabilization) has a strong dependency on the patterns on the floor below. A flow sensor is a camera that relies on measuring pixel deltas from frame to frame, so if the floor is blank or has a repeating pattern, it can be difficult to hold position properly. Despite these limitations, using hand gestures to control the Crazyflie with a flow deck installed as actually quite fun and surprisingly easy. I’m currently working on some new features that I hope will open the door for more interesting applications. All of what follows is a work in progress, and not yet implemented or functional. Dream with me! The orientation problem could be improved: transforms could be applied to gestures to cause the Crazyflie to respond to commands in the user’s frame of reference (so ‘pushing’ away from one’s self would cause the Crazyflie to fly away from the user, instead of whatever direction is ‘forward’ to the Crazyflie’s perspective). 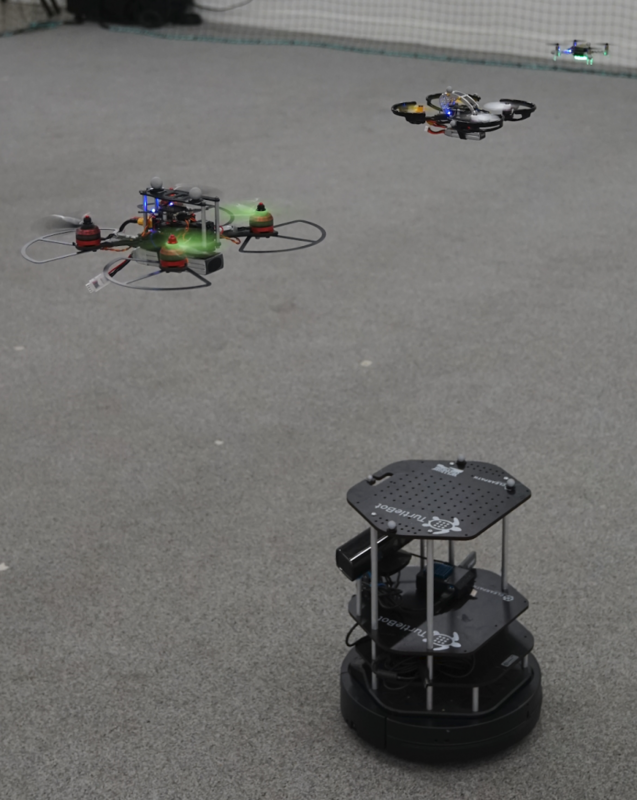 A ‘follow me’ mode, where the crazyflie autonomously follows behind a user as he or she moves throughout the space. Ability to walk around and manually set waypoints by selecting points of interest in the environment. The Loco Positioning System is a natural fit here. A setup step (where a spatial anchor or similar is established at same physical position and orientation as the LPS origin) and a simple transform for scale and orientation (HoloLens and the Crazyflie define X,Y,Z differently) would allow the HoloLens and Crazyflie to operate in a shared coordinate system. One could also use the webcam on the HoloLens along with computer vision techniques to track the Crazyflie, but that would require constant line of sight from the HoloLens to the Crazyflie. The next step after establishing a shared coordinate system is to use the HoloLens for obstacle detection and avoidance. 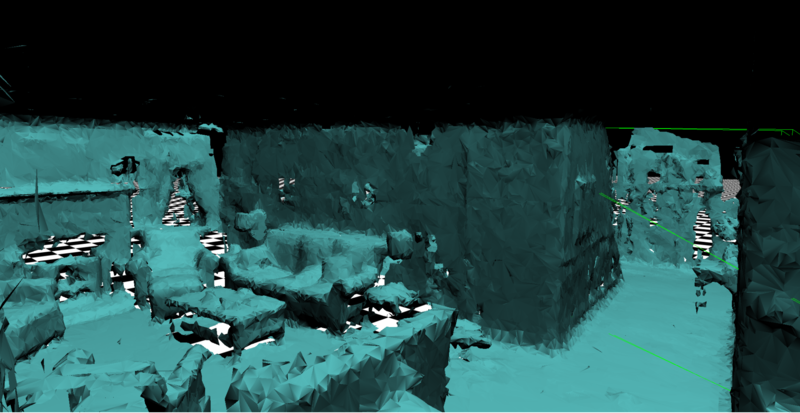 The HoloLens has the ability to map surfaces in real time and position itself in that map (SLAM). Logic could be added to the HoloLens to consume this surface map and adjust pathing/setpoints to avoid these obstacles without reducing the overall compute/power budget of the Crazyflie itself. As a simple extension of the shared coordinate system (and what Bitcraze has been doing with TDoA and swarming lately) the HoloLens could be used to manipulate individual Crazyflies within a swarm through raycasting (the same technique used to gaze at, select and move specific holograms in the digital domain). Or perhaps a swarm could be controlled to move out of the way as a user passes through the swarm, and return to formation afterward. There’s no shortage of interesting applications related to blending augmented reality with the Crazyflie, but there’s quite a bit of work ahead to get there. Keep an eye on the Bitcraze blog or the forums for updates and news on this effort. I’d love to hear what ideas you have for combining augmented reality devices with physical devices like the Crazyflie. Leave a comment with thoughts, suggestions, or any other relevant work! Here at the USC ACT Lab we conduct research on coordinated multi-robot systems. One topic we are particularly interested in is coordinating teams consisting of multiple types of robots with different physical capabilities. Applications such as search and rescue or mapping could benefit from such heterogeneous teams because they allow for more flexibility in the choice of sensors and locomotive capability. A core challenge for any multi-robot application is motion planning – all of the robots in the team need to make it to their target locations efficiently while avoiding collisions with each other and the environment. 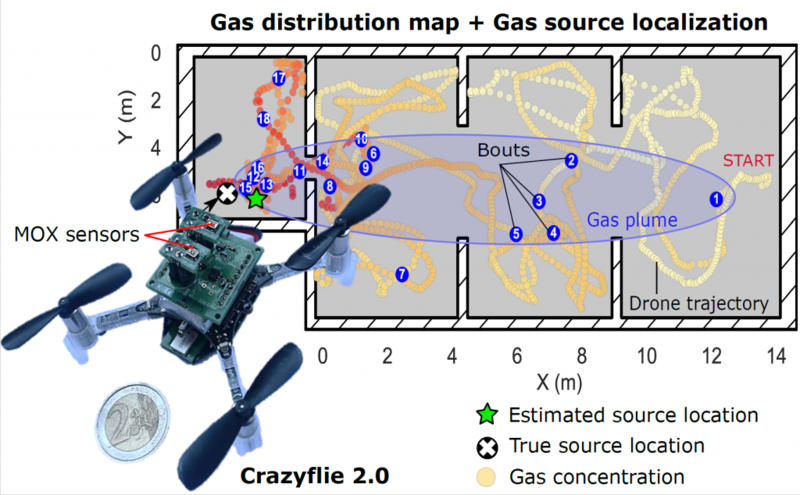 We have recently demonstrated a scalable method for trajectory planning for heterogeneous robot teams utilizing the Crazyflie 2.0 as the flight controller for our aerial robots. To test our trajectory planning research we wanted to assemble a team with both ground robots and multiple sizes of aerial robots. We additionally wanted to leverage our existing Crazyswarm software and experience with Crazyflie firmware to avoid some of the challenges of working with new hardware. Luckily for us the BigQuad deck offered a straightforward way to super-size the Crazyflie 2.0 and gave us the utility we needed. With the BigQuad deck and off-the-shelf components from the hobbyist drone community we built three super-sized Crazyflie 2.0s. Two of them weigh 120g (incl. battery) with a motor-to-motor size of 130mm, and the other is 490g (incl. battery and camera) with a size of 210mm. Integrating the new platforms into the Crazyswarm was fairly easy. We first had to re-tune the PID controller gains to account for the different dynamics of the larger platforms. This didn’t take too long, but we did crash a few times — luckily the components we chose were able to handle the crashes without any breakages. After tuning the platforms behave very well and are just as easy to work with as the original Crazyflie 2.0. We additionally updated the Crazyswarm package to be able to differentiate between BigQuad and regular Crazyflie types and those updates are now available for use by anyone! In future work, we are excited to do hands-on experiments with a prototype of the CF-RZR. This new board seems like a promising upgrade to the CF 2.0 + BQD combination as it has upgraded components, an external antenna, and a standardized form factor. Hopefully we will see the CF-RZR as part of the Crazyswarm in the near future! This is a guest blog post written by Fred, the maintainer of the Android Crazyflie client and Java Crazyflie lib. As a follow-up to last week’s blog post about the different Crazyflie clients, I would like to describe the current status of the Android client in a bit more detail. After more than a year, Version 0.7.0 of the Android client has been released last Friday (March 16). Most importantly this release fixes a very annoying UI bug that appeared on newer Android versions, where the on-screen joystick did not show up when the app was started for the first time. It also adds support for height hold mode when using the zRanger or Flow deck, it adds a console view (can be enabled in Settings -> App settings -> Show console) and also shows the link quality for BLE connections now. You can read the full changelog on Github. You can find the release in the Google Play Store and as an APK on GitHub. Apart from the obvious/visible new features and bug fixes, quite a lot has happened “under the hood”. Some parts of the code were cleaned up, refactored, decoupled, etc. This is still a work in progress though. Admittedly there was almost no documentation for the Android client and some features are hidden (too well). In an effort to change that, I’ve started to document some features on the project’s Github wiki. If you find bugs in the app, want to request a feature or see errors in the documentation, please open a GitHub issue. If you are interested in the development of the Crazyflie Android client and want to get involved, let me know. The fastest way to get new features added or bugs fixed is to contribute a pull request. This week we have a guest blog post by Ben, enjoy! I’m Ben Kuperberg and i’m a digital artist, artist-friendly software developer and orchestra conductor. Being a juggler, I’ve decided to focus some of my work on the intersection between juggling and technology, and i’ve since been working more and more with jugglers, my last project being “Sphères Curieuses” from Le Cirque Inachevé, created by Antoine Clée. While the whole project is not focused on drones, a part of it involves synchronized flight of multiple drones and precise human interaction with those drones. Swarm flight is something already out there and some solutions already exist but the context of this project added some challenges to it. Most work on drone swarms have been done by research group or school. They use high-grade expensive motion-capture system able to track precisely the drones and able to assign their absolute positions. While the quality of the result is undeniable, it’s not fit for stage shows : the setup is taking a lot of time which we can’t always have when the show is on the road. Moreover, the mocap system is too invasive for the stage if you want to be able to “hide” a bit the technology and let the spectator focus on what the artist wants you to see. Not to mention it costs an arm and a leg and Antoine needs both to juggle. So we had to find other ways to be able to track multiple drones. That’s when we found out the [amazing] team at Bitcraze was working on the TDoA technology, which allows precise-enough tracking of a virtually unlimited amount drones, at reduced cost and with a fast and clean setup. 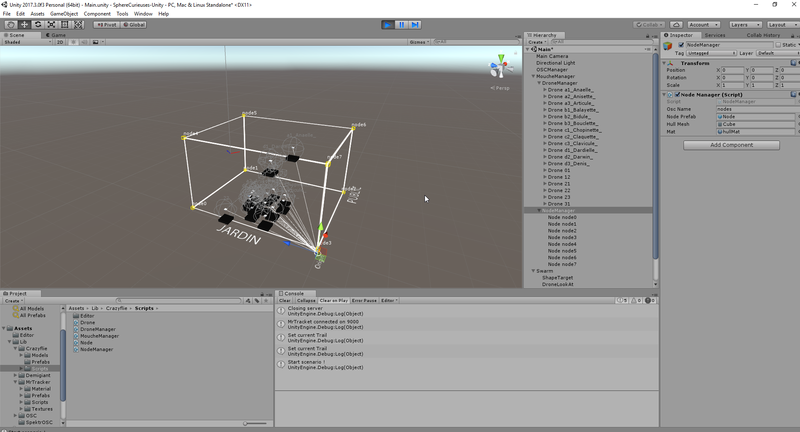 After some work we managed to have a first rough version of our swarm server made by Maxime Agor that allowed to connect and move multiple drones using the TDoA system, controlled from a Unity application. While we were able to present a decent demo with this system, we were facing a major problem of reactivity. When working with artists and technology, reactivity is a key component to creativity. Because it can be frustrating and tense to stop each 2 minutes to make changes or fix problems. My first priority was therefore to prepare and design softwares that will allow me to spend most of the “creation time” on the actual creation aspect and not on technical parts. It is also essential that the artist performing in front of the audience can entirely focus on the performance and by fully confident in this technology. The last challenge is that as I focus my work on the creation and not touring, all my work needs to be easily understood and modified by both the artists and the technicians who will take over my work for the tour. 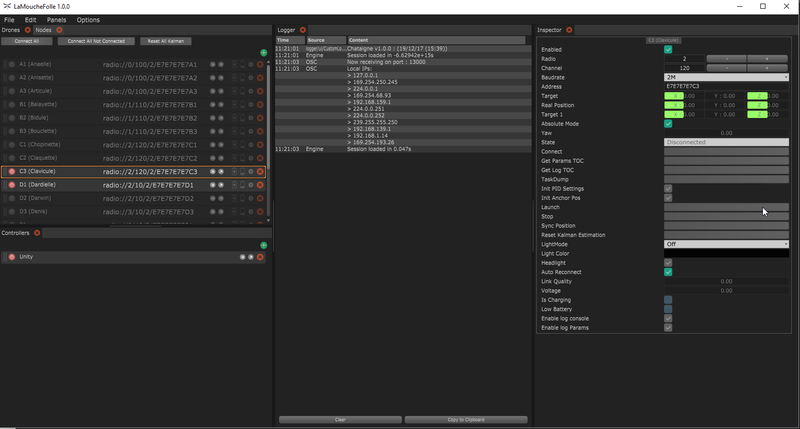 With all of that in mind, I decided to create a software with a high-end user interface called “La Mouche Folle” (« The Crazy Flie » in french) that allows to control multiple drones and have an overview of all the drones, their battery/charging/alert states, auto-connect / auto-reboot features, external control via OSC, and a Unity client to view and actually decide how to move the drones. All my work is open-source, so you can find the software on github. There only is a Windows release for now but it should compile just fine on OSX and Linux, the software is made with JUCE, depends on OrganicUI and lib-usb. Feel free to contact me if you want more information on the software. Many thanks Wolfgang Hoenig for the support and the great work on the crazyflie cpp library i’m relying on. So this is the basic setup of our project, but we needed more than that to control the drone. We wanted to be able to control them in the most natural way possible. We quickly decided to go with glove-base solutions, and have been working with Specktr to get our hands – pun intended – on developer versions of the glove. The glove is good but can’t give us absolute position of the hand, so we added HTC Vive trackers with the lighthouse technology and then were able to get both natural hand control and sub-millimeter precision of the tracked hand. 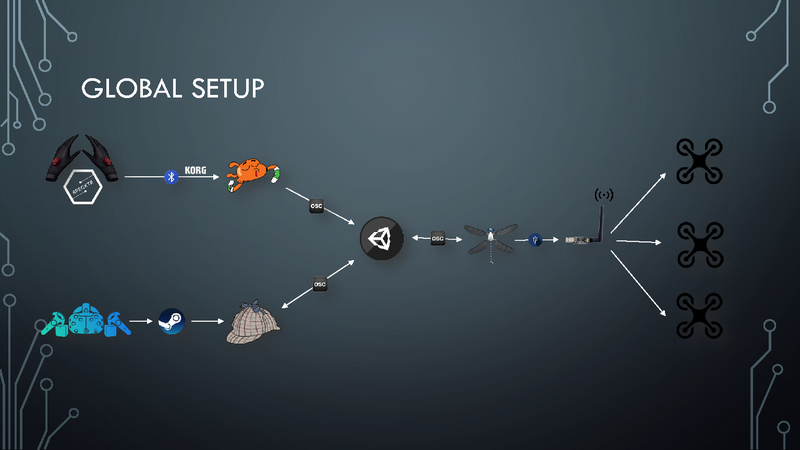 Then it was a matter of connecting everything together : for other projects for Theoriz Studio, I already developed MrTracker (used in the MixedReality project) that acts as a middleware between the Vive trackers and Unity. I used Chataigne to easily connect and route the Specktr Glove data to Unity as well so we would have maximum flexibility to switch hardware or technology without breaking whole setup if we needed to. In the past years, i’ve come to work on a lot of different projects, with different teams, which i like very much, because each project leads to discover new people, new ways of working and new challenges to overcome. I’m having a great time working on this project and especially sharing everything with the guys at Bitcraze and the community, everyone has been so cool and nice. I’ve planned to go at the Bitcraze studios to work for few weeks with them and i’m sure it’ll be a great experience ! Grasping objects is a hard task that usually implies a dedicated mechanism (e.g arm, gripper) to the robot. Instead of adding extra components, have you thought about embedding the grasping capability to the robot itself? Have you also thought about whether we could do it flying? In the GRASP Laboratory at the University of Pennsylvania, we are concerned about controlling robots to perform useful tasks. In this work, we present the Flying Gripper! It is a novel flying modular platform capable of grasping and transporting objects with the help of multiple quadrotors (crazyflies) working together. This research project is coordinated by Professor Mark Yim and Professor Vijay Kumar, and led by Bruno Gabrich (PhD candidate) and David Saldaña (Postdoctoral researcher). In nature, cooperative work allows small insects to manipulate and transport objects often heavier than the individuals. Unlike the collaboration in the ground, collaboration in air is more complex especially considering flight stability. 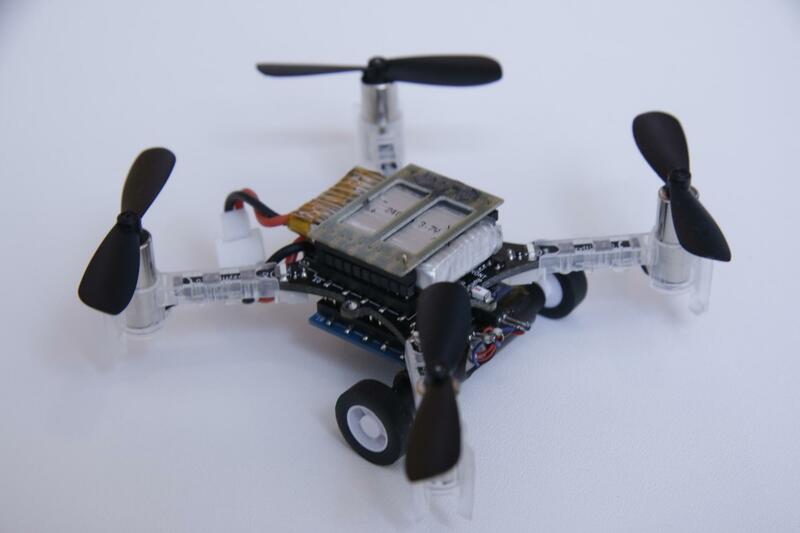 With this inspiration, we developed a platform composed of four cooperative identical modules where each is based on a quadrotor (crazyflies) within a cuboid frame with a docking mechanism. Pair of modules are able to fly independently and physically connect by matching their vertical edges forming a hinge. 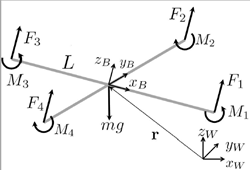 Four one degree of freedom (DOF) connections results in a one DOF four-bar linkage that can be used to grasp external objects. With this platform we are able to change the shape of the flying vehicle during flight and use its own body to constrain and grasp an object. 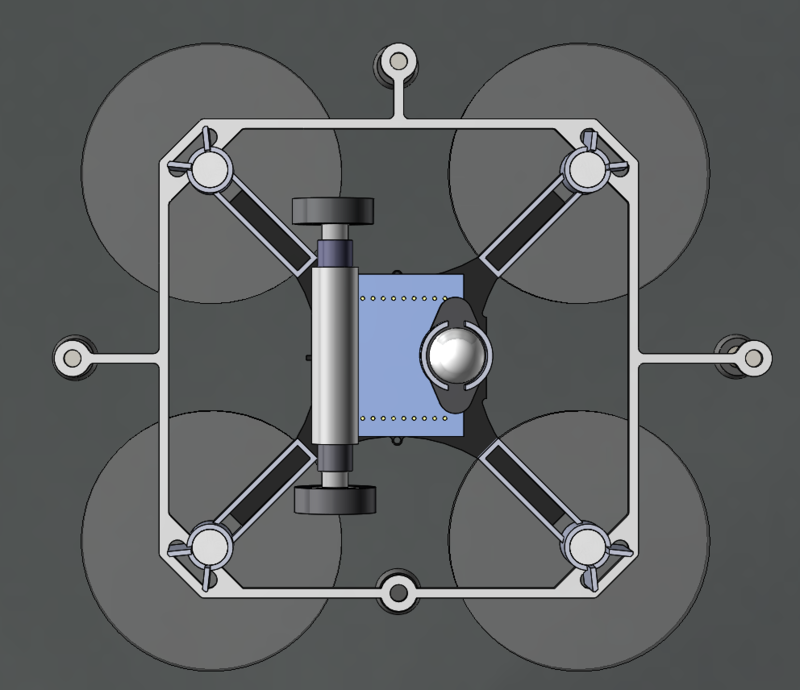 In the proposed modular platform, we use the Crazyflie 2.0. Its battery life lasts around seven minutes, though in our case battery life time is reduced due to the extra weight. The motor mounting was modified from the standard design, we tilted the rotors 15 degrees. This was necessary as more yaw authority was required to enable grasping as a four-bar. However, adding this tilt reduces the lifting thrust by 3%. Axially aligned cylindrical Neodymium Iron Boron (Nd-FeB) magnets, with 1/8″ of diameter and 1/4″ of thickness are mounted on each corner enabling edge-to-edge connections. The cylindrical magnets have mass of 0.377g and are able to generate a force of 0.4 kg in a tangential connection between two of the same magnets. This forms a strong bond when two modules connect in flight. Note that the connections are not rigid – each forms a one DOF hinge. The four attached modules results in a one DOF four bar linkage in addition to the combined position and attitude of the conglomerate. The four-bar internal angles are controlled by controlling the yaw attitude of each module. For example, two modules rotate clockwise and other two modules rotate counter-clockwise in a coordinated manner. Collaborative manipulation in air is an alternative to reduce the complexity of adding manipulator arms to flying vehicles. In the following video we are able to see the Flying Gripper changing its shape in midair to accomplish the complex task of grasping a wished coffee cup. Would you like some coffee delivery? This week’s Monday post is a guest post written by members of the Computer Science and Artificial Intelligence Lab at MIT. One of the focuses of the Distributed Robotics Lab, which is run by Daniela Rus and is part of the Computer Science and Artificial Intelligence Lab at MIT, is to study the coordination of multiple robots. Our lab has tested a diverse array of robots, from jumping cubes to Kuka youBots to quadcopters. In one of our recent projects, presented at ICRA 2017, Multi-robot Path Planning for a Swarm of Robots that Can Both Fly and Drive, we tested collision-free path planning for flying-and-driving robots in a small town. Robots that can both fly and drive – in particular wheeled drones – are actually somewhat of a rarity in robotics research. Although there are several interesting examples in the literature, most of them involve creative ways of repurposing the wings or propellers of a flying robot to get it to move on the ground. Since we wanted to test multi-robot algorithms, we needed a robot that would be robust, safe, and easy to control – not necessarily advanced or clever. We decided to put an independent driving mechanism on the bottom of a quadcopter, and it turns out that the Crazyflie 2.0 was the perfect platform for us. The Crazyflie is easily obtainable, safe, and (we can certify ourselves) very robust. Moreover, since it is open-source and fully programmable, we were able to easily modify the Crazyflie to fit our needs. Our final design with the wheel deck is shown below. A photo of the Crazyflie 2.0 with the wheel deck. The wheel deck consists of a PCB with a motor driver; two small motors mounted in a carbon fiber tube epoxied onto the PCB; and a passive ball caster in the back. We were able to interface our PCB with the pins on the Crazyflie so that we could use the Crazyflie to control the motors (the code is available at https://github.com/braraki/crazyflie-firmware). We added new parameters to the Crazyflie to control wheel speed, which, in retrospect, was not a good decision, since we found that it was difficult to update the parameters at a high enough rate to control the wheels well. We should have used the Crazyflie RealTime Protocol (CRTP) to send custom data packages to the Crazyflie, but that will have to be a project for another day. The table below shows the mass balance of our miniature ‘flying car.’ The wheels added 8.3g and the motion capture markers (we used a Vicon system to track the quads) added 4.2g. So overall the Crazyflie was able to carry 12.5g, or ~44% of its body weight, and still fly pretty well. 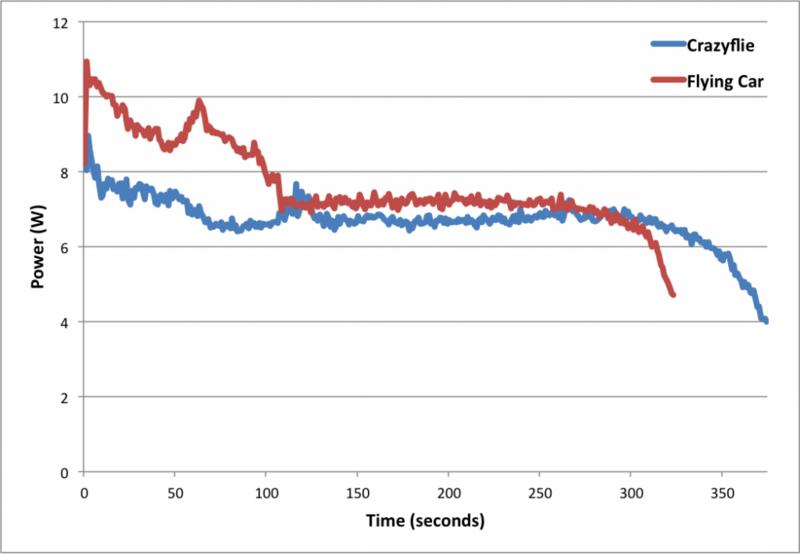 Next we measured the power consumption of the Crazyflie and the ‘Flying Car.’ As you can see in the graph below, the additional mass of the wheels reduced total flight time from 5.7 minutes to 5.0 minutes, a 42-second or 12.3% reduction. The table below shows more comparisons between flying without wheels, flying with wheels, and driving. 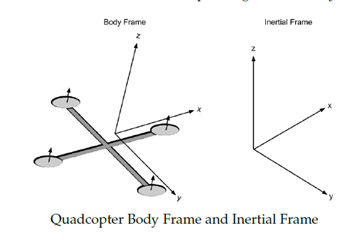 The main takeaways are that driving is much more efficient than flying (in the case of quadcopter flight) and that adding wheels to the Crazyflie does not actually reduce flying performance very much (and in fact increases efficiency when measured using the ‘cost of transport’ metric, which factors in mass). These facts were very important for our planning algorithms, since the tradeoff between energy and speed is the main factor in deciding when to fly (fast but energy-inefficient) versus drive (slow but energy-efficient). Controlling 8 Crazyflies at once was a challenge. The great work by the USC ACT Lab (J. A. Preiss, W. Hönig, G. S. Sukhatme, and N. Ayanian. 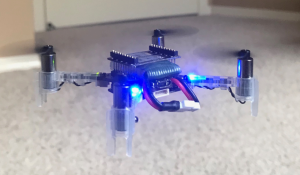 “Crazyswarm: A Large Nano-Quadcopter Swarm,” ICRA 2017. https://github.com/USC-ACTLab/crazyswarm) has made our minor effort in this field obsolete, but I will describe our work briefly. 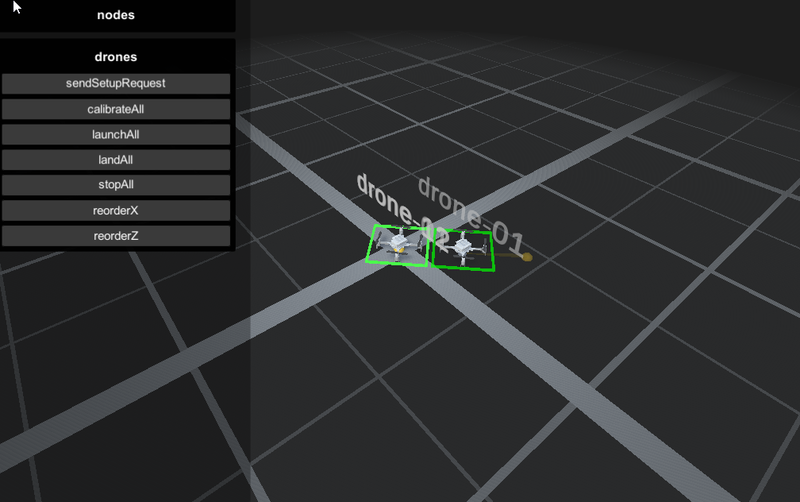 We used the crazyflie_ros package, maintained by Wolfgang Hönig from the USC ACT Lab, to interface with the Crazyflies. Unfortunately, we found that a single Crazyradio could communicate with only 2 Crazyflies at a time using our methods, so we had to use 4 Crazyradios, and we had to make a ROS node that switched between the 4 radios rapidly to send commands. It was not ideal at all – moreover, we had to design 8 unique Vicon marker configurations, which was a challenge given the small size of the Crazyflies. In the end, we got our system to work, but the new Crazyswarm framework from the ACT Lab should enable much more impressive demos in the future (as has already been done in their ICRA paper and by the Robust Adaptive Systems Lab at Carnegie Mellon, which they described in their blog post here). We used two controllers, an air and a ground controller. The ground controller was a simple pure pursuit controller that followed waypoints on ground paths. The differentially steered driving mechanism made ground control blissfully simple. The main challenge we faced was maximizing the rate at which we could send commands to the wheels via the parameter framework. For aerial control, we used simple PID controllers to make the quads follow waypoints. Although the wheel deck shifted the center of mass of the Crazyflie, giving it a tendency to slowly spin in midair, overall the system worked well given its simplicity. Once we had the design and control of the flying cars figured out, we were able to test our path planning algorithms on them. You can see in the video below that our vehicles were able to faithfully follow the simulation and that they transitioned from flying to driving when necessary. Our work had two goals. One was to show that multi-robot path planning algorithms can be adapted to work for vehicles that can both fly and drive to minimize energy consumption and time. The second goal was to showcase the utility of flying-and-driving vehicles. We were able to achieve these goals in our paper thanks in part to the ease of use and versatility of the Crazyflie 2.0.